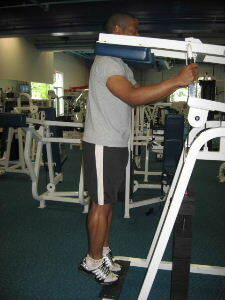 2 leg calf raises (heel raises) on a standing calf machine are a great way to build up your calf muscles. I am a big fan of calf (heel) raises on a step with no resistance, but once your calf strength improves, you can add resistance by doing your heel raises on a standing calf machine. 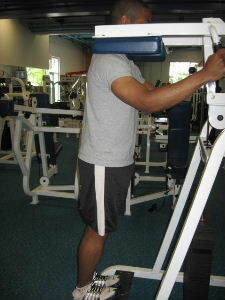 Below are pictures of how to use the standing calf machine. Starting Position: Position your feet firmly on the step of the calf machine. Allow your heels to hang below the level of the step. Adjust the shoulder pad to a level that allows you to get a good stretch in the calf at the starting position. Form: Exhale and raise on to your tip toes. Hold for a brief second at the top and then slowly lower to the starting position. Personal Trainer Tips: With this exercise it is important to move through the full range of motion. Make sure that you get a good stretch at the bottom of the range of motion. Also, move in a slow and controlled manner. Note: The standing calf machine challenges the core muscles because it pushes down on your spine. Make sure that you engage your abdominal muscles and lower back muscles so that you keep good posture while you're doing this exercise. If you don't have access to a calf machine, you can still do heel raises on a step to get a great calf workout.